Jackfruit Confit — Have You Heard Of It? Fluffy Ombre Pancakes — Stack ’Em High and Watch ’Em Fly! Baked Falafels — Because Deep Frying Is a Mess! 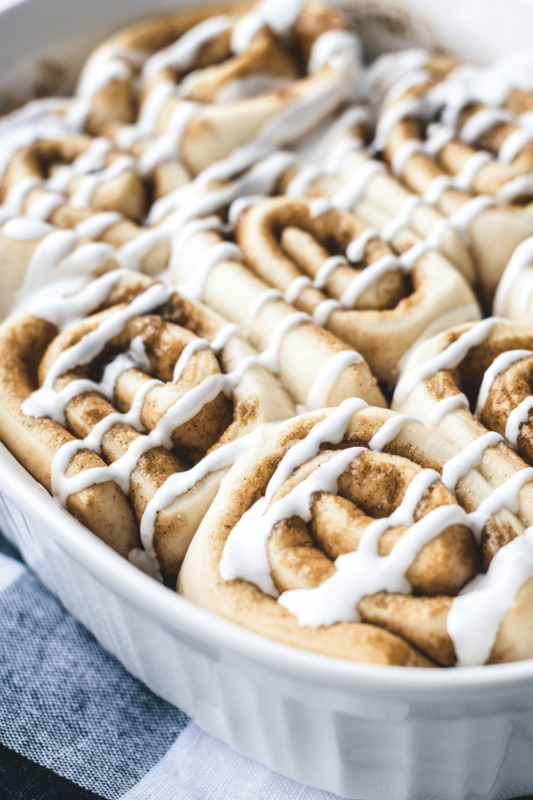 Which is it: Cinnamon Rolls or Cinnamon Buns? 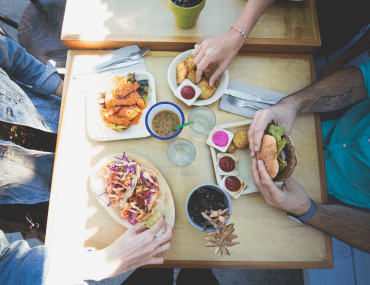 Word Bowls — When Your Food Really Speaks To You! Love How You Feel — It starts with breakfast …and some greens! 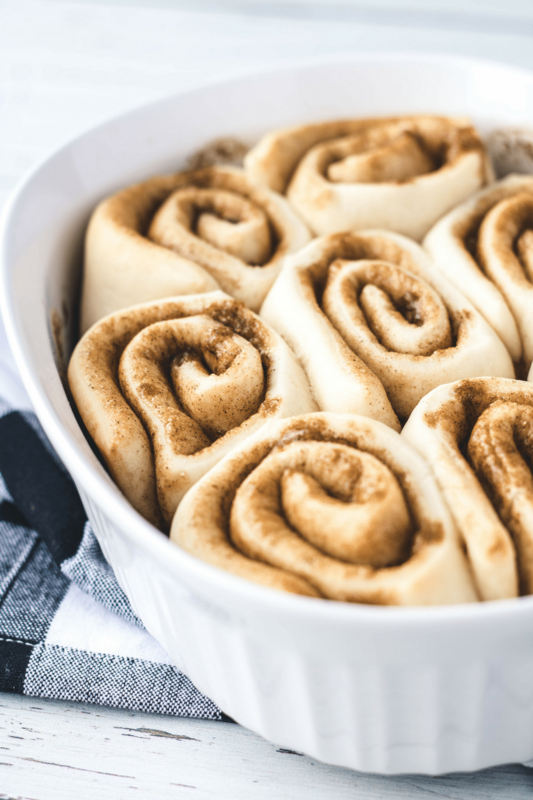 Individual vegan cinnamon rolls just waiting to be frosted. 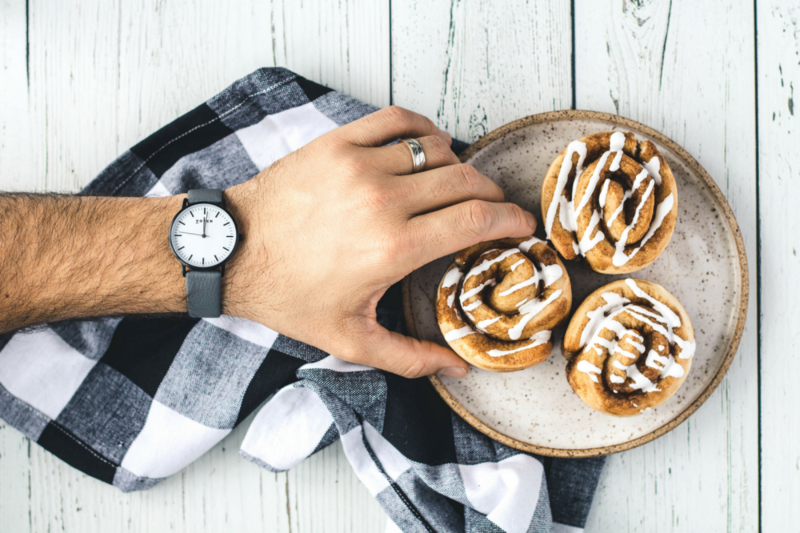 I suddenly find myself wondering if cinnamon buns are a thing at all! 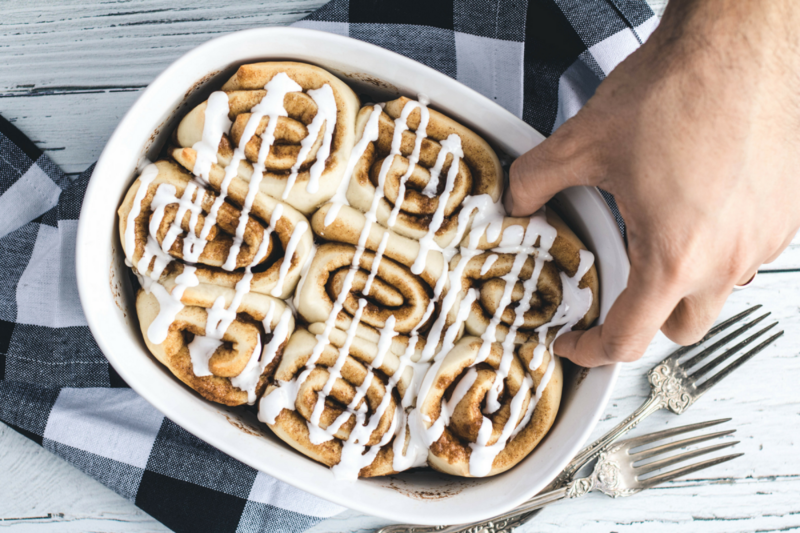 Apparently there are cinnamon rolls and sticky buns. But cinnamon buns? Not quite as common a word as I expected. 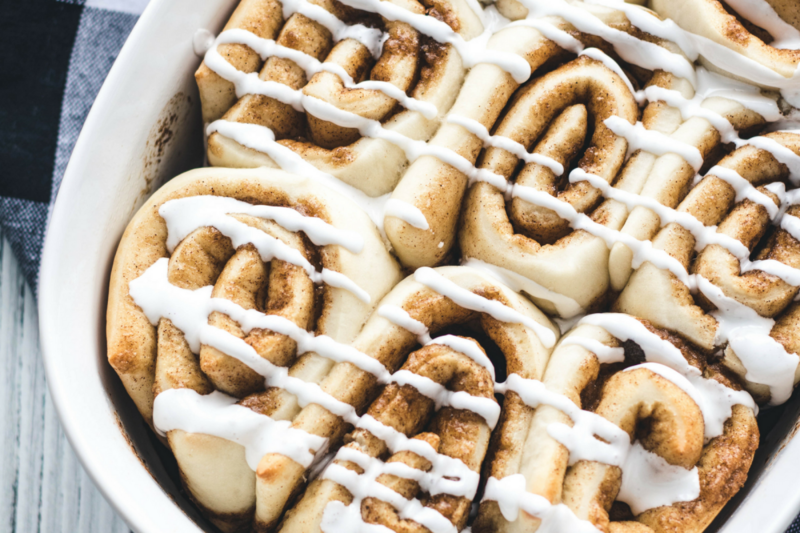 So let’s call a cinnamon bun and a sticky bun the same thing. 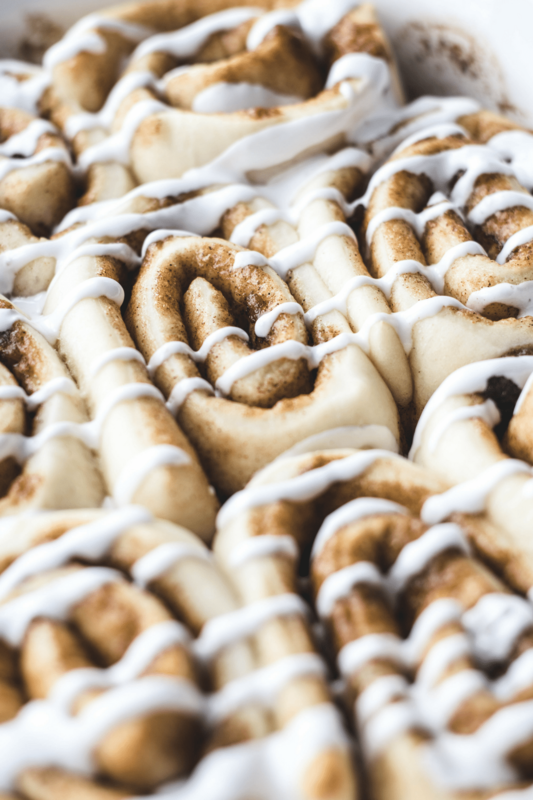 Now, what makes a cinnamon roll different? Squeeze bottles made for sauces are a great way to evenly distribute icing. We found ours at the dollar store. My favourite is always the one in the middle! You can discern one from the other by the presence (or absence) of frosting. 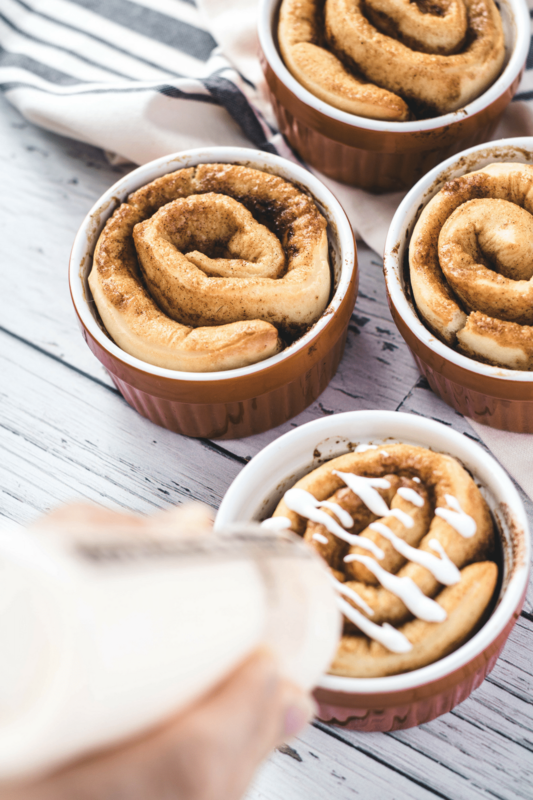 A cinnamon roll must have vanilla or cream cheese icing; a sticky bun marinates in its own brown sugar glaze. Sounds legit. 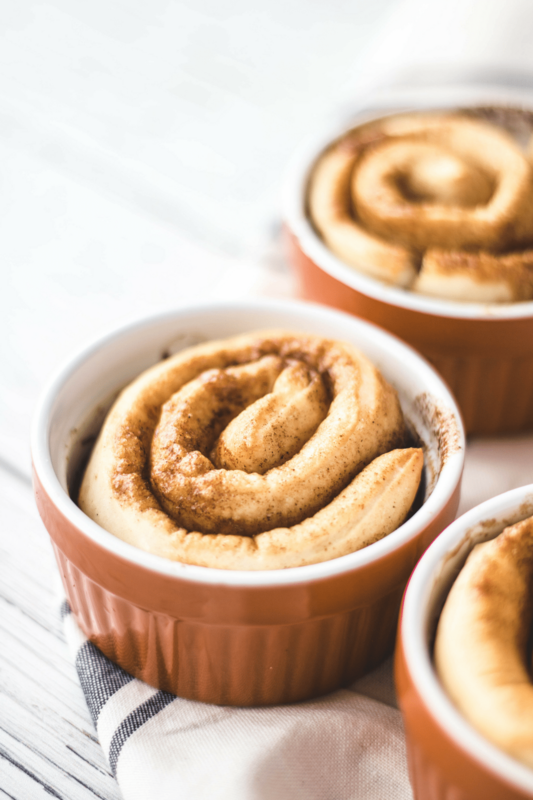 So this is most definitely a vegan cinnamon ROLLS recipe, and not one for cinnamon buns (or sticky buns, actually). Could it be that saying ‘cinnamon bun’ is a Canadian thing? …or am I the only one who uses it? 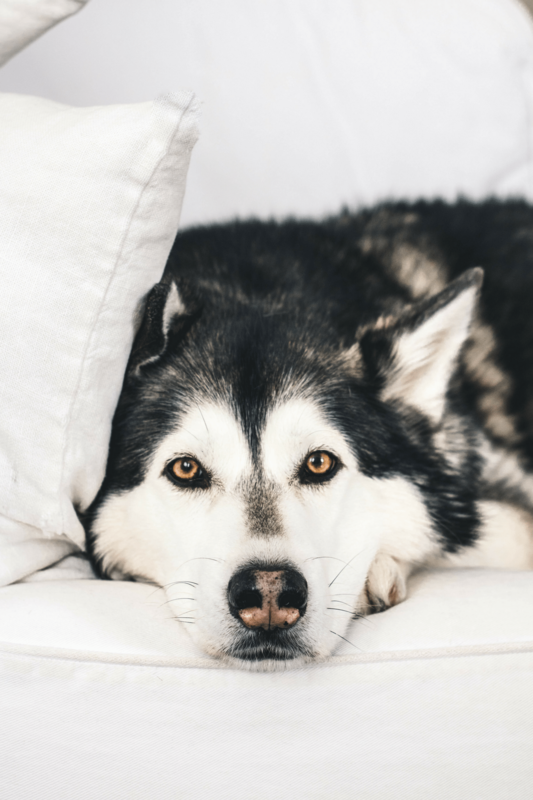 Blizzard relaxes on the couch while we ice and shoot the vegan cinnamon rolls. I think he knows none are coming his way. Digging our background? It’s available here in our shop. If you’re not craving these yet, can I please have your willpower? 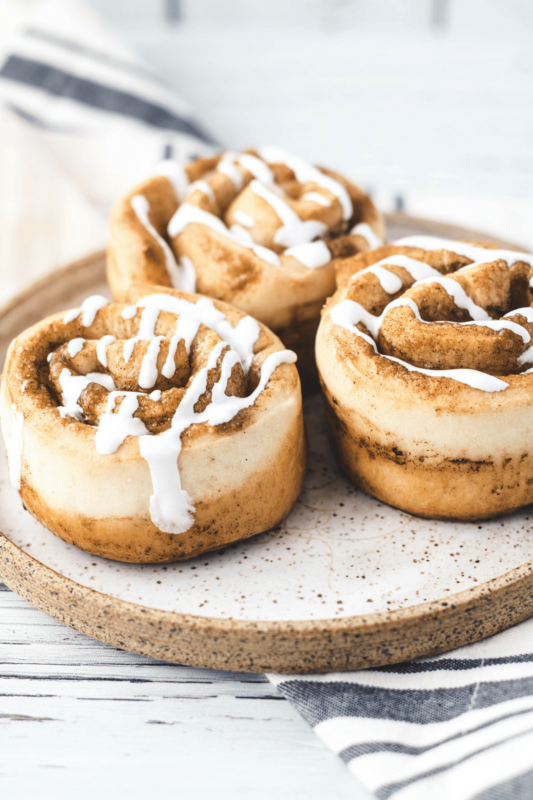 Before you get worried about vegan cinnamon rolls being too complicated, let me say that they are most definitely not. This is a really straightforward recipe. Prep the dough, let is rise. Mix the filling, spread on dough, roll, and bake. Prep the icing and drizzle. I’ve thrown this together twice in the past week already. Neither time taking much longer than a couple of hours, and that long only to give them time to rise. 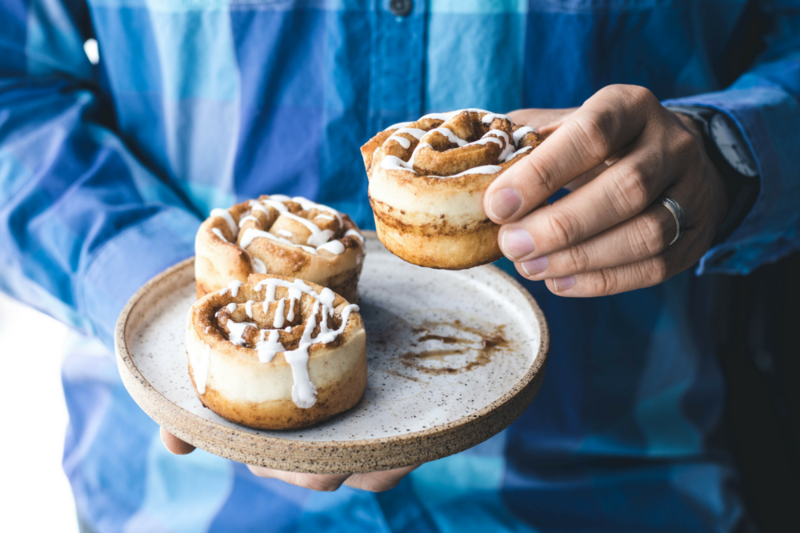 Just when you thought they couldn’t look better, VIVIAN’s plates take our cinnamon rolls to another level. Shop her collection in our store here. Not a moment yet that I’m not thrilled with my Votch Black & Slate Grey watch from their new collection. Warm the milk just enough to melt the butter. If it’s too hot, it’ll kill the yeast, so be careful. Whisk the butter into the milk. Sprinkle the yeast onto the liquid and let it proof for 10 minutes. It will start to foam slightly. When it does, mix in the sugar and salt. Using a stand mixer and dough hook, add the flour 1/2 cup at a time. If you add it all at once, the mixture will be too difficult to combine. If after mixing for a few minutes, you find that the mixture is too dry, add splashes of milk. Mix until the dry spots are gone. When combined, transfer to your counter and knead the dough by hand for a minute or two. Let it rise for 1 hour in a greased bowl. When the dough has doubled, roll it out into a rectangular shape. While the dough is rising, prepare the filling. Add the sugar, cinnamon, and vanilla to the melted butter and mix well. Spread the filling on the dough so that it is evenly covered. Roll the dough in a way that you have a longer roll. Slice into even sections, about 1.5 inches tall. The dough will fill an 8×8 inch pan, but you can use smaller, larger, or even individual pans if you want. Make sure they are greased. Allow the dough some space in between. They shouldn’t touch, as they’ll continue to rise and fill up the empty space. Preheat your oven to 350F, then bake for 20 minutes on the middle rack, until golden brown. While the rolls bake, prepare the icing by mixing the aquafaba until fluffy. This is easiest with a handheld mixer. Add the powdered sugar and mix until smooth. When the buns have cooled several minutes, ice them by drizzling or spreading the icing. Meal Prep: They freeze well. For best results, bake the buns individually, allow to cool completely, then freeze. Defrost in the fridge or on the counter, then microwave for 10-20 seconds right before eating. Icing: The icing can be made thicker or thinner by adjusting amounts of powdered sugar or aquafaba. Keep in mind that less than 3 tbsp will be hard to whip. A light drizzle or layered on thick. 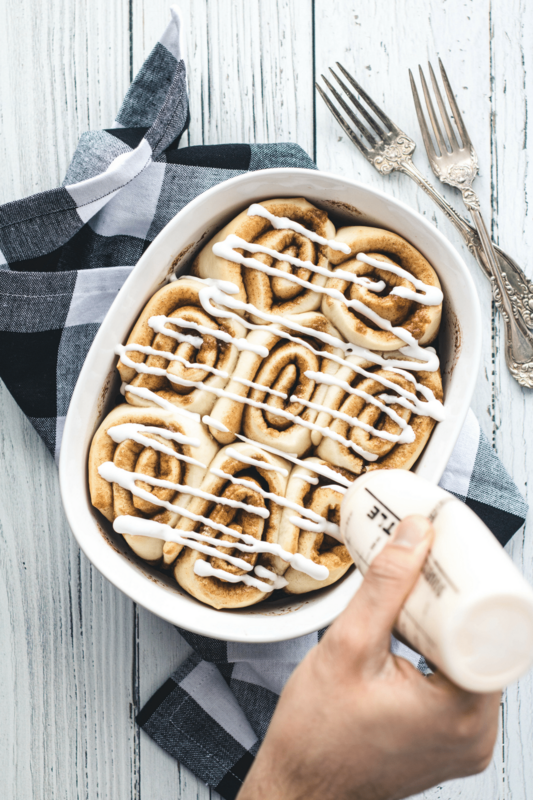 There’s no wrong way to frost vegan cinnamon rolls. Best served warm. Pop them in the microwave for 10-20 seconds when you have leftovers. Time for you to start baking! Share your photo on Instagram and tag us @ehvegan or use #ehvegan so we don’t miss it! Christopher Bill is a food, travel, and lifestyle content creator. Along with his wife Victoria, he is the co-creator of the popular Instagram account and blog, Eh Vegan. 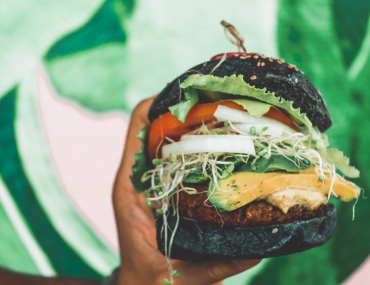 Established in 2016, Eh Vegan inspires people to live and travel cruelty-free through engaging video content, stunning photography, and mouth-watering recipes. Hi there! We're Vic and Chris — vegan foodies, travelers, and content creators from Montreal. Tag along as we explore all things cruelty-free. Get access to exclusive recipes and giveaways as a subscriber! Hey! We're Vic and Chris — vegan foodies, travelers, and content creators from Montreal. Tag along as we explore all things cruelty-free. © 2016–2018 Eh Vegan. All rights reserved.